The Lutheran church, cemetery, drystone walls, and surrounding associated land are of outstanding historical significance to the state of Victoria for their association with the state's promotion of German settlement in Victoria. The Lutheran church, cemetery, drystone walls and surrounding associated land are the central element in the most intact German settlement surviving in Victoria. The Lutheran church at Westgarthtown (Thomastown) is the oldest surviving Lutheran church in Victoria and still conducts regular services. It represents an almost continuous tradition of worship since 1856, and reflects the pivotal role of the church in the devout Lutheran community in its location at the centre of the original 640 acres purchased by William Westgarth and captain john Stanley Carr. The church, cemetery and surrounding associated land have an important association with William Westgarth, MLC, a notable pioneer of Victoria, who was directly responsible for the immigrant communities in Victoria. The church, constructed of local bluestone in 1856 is a simple stone preaching-hall, embellished by half round arch-head windows and entry door. The entry door has been moved from the west to the east side, but the church is otherwise intact and in good condition. The church building reflects the craftsmanship of the early German settlers particularly in the working of bluestone. The cemetery contains the graves of many of the original German settlers. It is privately owned by the Thomastown Lutheran congregation and remains open to congregation members and descendants of the original settlers. Lutheran Church and Cemetery, corner Gardenia Road and Rosedale Drive, Thomastown. 1. The building known as the Lutheran Church, Corner Gardenia Road and Rosedale Drive, Thomastown, (marked B-1) the cemetery (marked S1), and drystone walls (marked S2) on Plan 604928J endorsed by the Chairperson, Historic Buildings Council and held by the Director, Historic Buildings Council. 2. 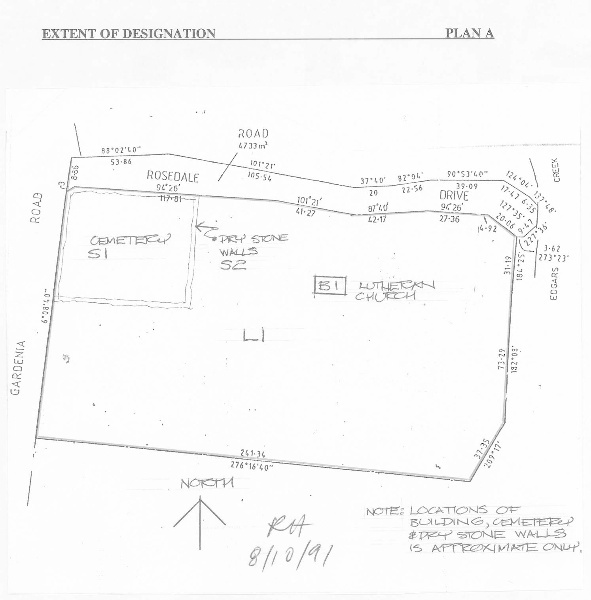 The land marked L-1 on Plan 604928J, endorsed by the Chairperson, Historic Buildings Council and held by the Director, Historic Buildings Council, being all the land described in Book 882 No. 927. 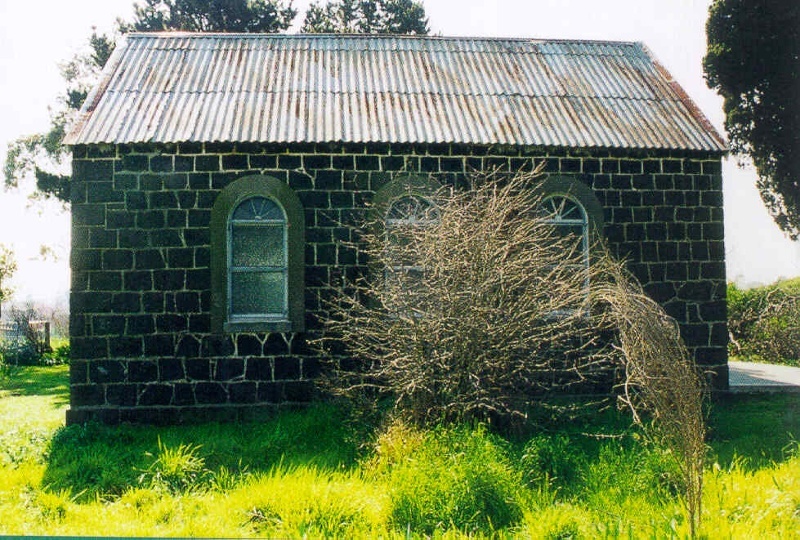 "In 1856 the Westgarthtown Lutheran Church was erected on land reserved at the centre of the settlement for a church, school, cemetery and shops. The simple bluestone church was built using 51 cm bluestone blocks cut from stone quarried just 30 metres north of the building. Construction of the church was undertaken by local stonemasons Mssrs Kringel and Einer at a cost of about 320 pounds. On 17 November 1856 the Westgarthtown Lutheran Church was dedicated by Pastor Goethe. Now the second oldest Lutheran Church in Australia (the oldest is in Lobethal, South Australia) it remains little changed since that time. The Lutheran cemetery , enclosed by a dry-astone wall, still remains and is one of only a handful of ethnic cemeteries in Victoria. The German origins of those laid to rest here is visible on the headstones - many are inscribed in German and some in both German and English. The cemetery, surrounded by Monterey pines and Italian cypresses planted in the 1860s and 1870s, is known to be the final resting place of 125 people. Estimates place the number of burials here at up to 200, with the first believed to be that of a stillborn baby in 1850.. The oldest headstone is from 1867. Source: 'Westgarthtown; a German Village in the Suburbs' , Australian Heritage, 2006, pp. 9-11.